1/28/2007 – On Friday a new book was released in Bulgaria called "Toilet War – A chess drama in 13 acts." It is by Zhivko Ginchec, the press officer of the Bulgarian team in Elista, and describes the "biotechnological attacks" Veselin Topalov was subjected to by the Kramnik side. In the meantime Silvio Danailov has reacted to the allegations of cheating raised by a German newspaper. Report from the combat zone. 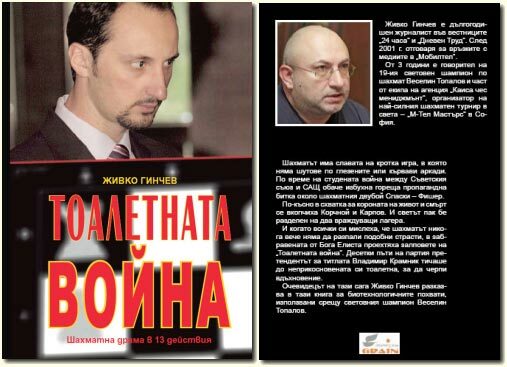 On Friday in Sofia a new book by the Bulgarian journalist Zhivko Ginchec was released, called "Toilet War". The subtitle is "A chess drama in 13 acts". The first edition has been printed in 20,000 copies. We have not yet managed to procure a copy, but associates are purchasing some in Bulgaria and have promised to review the contents for us. As soon as we have this information we will bring it to you on our news pages. The German journalist Dagobert Kohlmeyer reports that the book describes the twelve games between Kramnik and Topalov in Elista, and the tiebreak in the end, but with very little actual chess content (just the notation of the games are included). The author is mainly concerned with the ominous circumstances of the duel and the intense conflict between the protagonists. Kohlmeyer: "The date of public release of this book was not a coincidence. 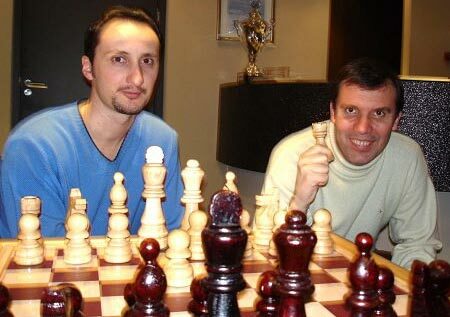 It happened one day before the explosive game between Topalov and Kramnik at the Wijk aan Zee tournament. So the Bulgarians played their next move outside the chessboard." Our associates in Bulgaria tell us that the highlight of the book is a graphic description and pictures of computer cables that were allegedly found in the ceiling of Kramnik's rest room at the tournament venue in Elista. The back cover of the book states: "Chess has the reputation of being a quiet game, in which there are no ankle injuries or bruised elbows. But in the godforsaken town of Elista we hear the artillary volleys of a toilet war." Kramnik's repeated visits to the toilet are characterised by the author as "biotechnological poison" that Kramnik used against Topalov. Kohlmeyer, who spoke with Danailov and Topalov in Wijk aan Zee, reports that Topalov's manager was seeking to play down the importance of an interview that Topalov gave the Spanish newspaper ABC. "It was an idiot, some local journalist who got the chance for the first time in his life to publish a big story. Veselin did not say the things that appeared in the interview in that form. The writer did not know how to conduct an interview. And he did not have the text authorised by his interview partner." Kramnik's manager Carsten Hensel, who has filed a complaint with the FIDE Ethics Committee because of the accusations raised in the interview, said that the journalist had a tape recording of the interview, proving that the insulting and accusatory comments were actualy made by Topalov. Kohlmeyer: "The war between the two sides continues." It is obvious that some people just cannot accept the fact that the first player in the Elo list is not the one that played against Fritz. They also cannot accept the facts exposed in the toiletgate book published by Grain Advertising and Zhivko Ginchev. In a desperate attempt to diminish Topalov’s success, another media attack has been launched. It is a shameful act by Chessbase and German media against Veselin Topalov. The text inside is not even worth commenting. But it brings high suspicions that somebody is not comfortable that the N1 player keeps on proving that he is the best. The media attack also comes as a response to a carefully collected picture and evidence material by Zhivko Ginchev. He published his book just a few days ago and exposes a significant number of facts and inside stories that bother personal interests. However, the exact dates, photos, and words in Ginchev’s book “The toilet war” have stable grounds, while the shameful attack against Topalov has no single fact to support it. Well, there is something that deserves a comment. The article says, “Neither Danailov nor Topalov were available for comment during the past week, in spite of repeated attempts to contact them.” Is this a joke? Are we supposed to laugh? Topalov is the man that gave most press conferences, talked to many people from the audience, gave interviews, participated in radio broadcasts. The whole team of veselintopalov.net, together with the many fans that sent emails of support, expresses their worries about the media attacks that have become more than frequent. 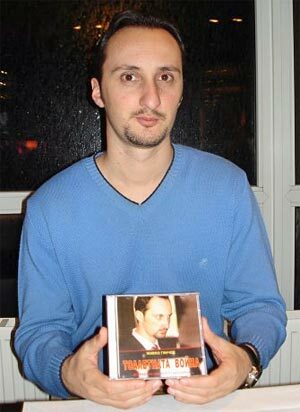 Veselin Topalov is a man that works for chess, it’s development, and promotion. If you people, that write articles with no facts or credible arguments, do not care about the future development of chess and the ones that work for it’s promotion, you should at least not hinder that process. We hardly need to stress that the report by Martin Breutigam was not initiated or published by ChessBase. It was the work of a major independent newspaper with which ChessBase has no affiliation or editorial influence. We would also like to mention that over the past year and a quarter (since the World Championship in San Luis) we have received a number of letters and articles on the same subject, mainly from players and grandmasters, but did not publish any of these, since in each case no direct evidence was provided. In the current case we only reported that a major newspaper had published a big (and potentially scandalous) chess story, a fact that we deemed newsworthy.